I couldn’t believe my ears listening to President Nana Akufo Addo let out the above in response to demands from Ghanaians that his Government urgently address the ever-growing issue of carnage on our roads at the Ghana Police Service WASSA annual get-together. 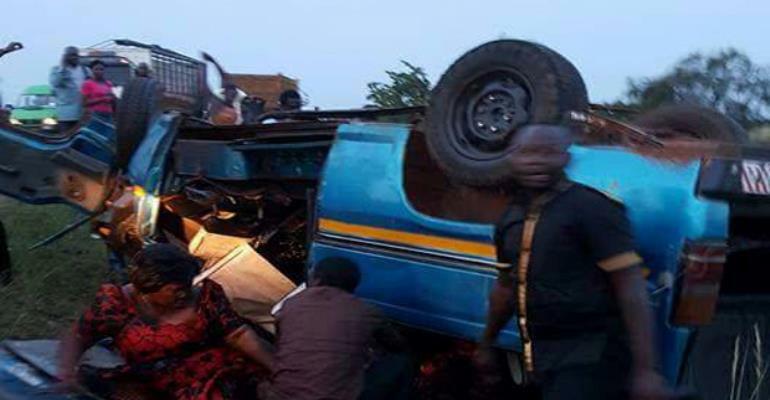 My disbelieve [maybe, I shouldn’t as it seemed its nature] stemmed from the fact that the Akufo Addo regime almost a year ago had gone to sleep, doing almost zilch to implement the Action Plan developed to curb road carnage, but only woke up to it after we were hit by the Kintampo and Mankessim accidents which claimed about 80 lives, leaving 50 others with varying degrees of injury. This is an Action Plan that Mr. President had granted Executive Approval for its immediate implementation after receiving and reviewing the Committee’s report. Resource the National Road Safety Commission to scale up public education and sensitization on road safety with an additional GH6.5 million from the Road Fund. Enforcement of Road Traffic Laws by the Police through spot fines by automation of MTTD operations. Partner with private towing companies and Nationwide Traffic Management and Enforcement Limited to vigorously enforce regulations. Now, as far as the named implementing agencies – NRSC, Police Service etc are concerned, there is very little that can be seen since the announced implementation commencement date. Elsewhere, heads of the implementing agencies and their responsible Ministers would for failure have resigned over such matters, without which the President would demand specific answers, mostly to be followed by dismissals if the explanations are not satisfactory. Ours, President Akufo Addo, knowing very well his government hasn’t fulfilled its part of the bargain and thinking the people have short memories, has sought to play smart by re-tasking the implementing agencies. It is the reason why we are where we are as a nation. No true concern or commitment to anything by the regime. This is evidenced in the fact that it took the President Thirteen  long hours after the 2 road accidents to on behalf of the nation sympathize with the victims and their families. It has been over 72hours, the President has neither visited any of the accident scenes nor the surviving victims at the hospital, let alone treat the cases as national emergencies as was the practice under the past regime. He rather jumped aboard the next available plane and is gone. The intriguing part is the speed with which our President passes comment on external issues such as the Ethiopian plane crash; the New Zealand Christ church attack, etc but would remain mute on same or worse things that are happening in his own country. As if that is not enough, the early hours of Friday that the entire country was grieving, the President’s cousin; Finance Minister, Ken Ofori Attah and NPP were jointly busy, organizing a “Kenkey party,” celebrating capability to borrow; adding $3billion to our public debt stock, caring little about the disasters. Are these the men? Greedy and heartless men! While we were in church on Sunday to worship, Information Minister with the NRSC head in tow had a press conference, rather than stating what has been achieved in the Action Plan within the past one year, it was lamentations of the already known challenges. What both of them have refused to realize is that their lamentations haven’t and wouldn’t change the 6 deaths per day that we record through road accidents and until those in authority wake up to their responsibilities, nothing is going to change. If for nothing at all, I for once expected the NRSC boss to be candid and to tell us about the challenges facing her office including the unpreparedness on the part of Government through Ministry of Finance to release budgetary allocations which is hampering NRSC performance. “If you fail to put forward the injured leg for treatment, deep in the night, it is you who will suffer the pain.” My grand-mum will always say. While at it, here are a few questions begging for answers from Government; How much of the 2 years GH670 million accrued budget had been released to NRSC? Can the government tell us the level of engagement with NTMEL and private towing companies in reintroducing towing services? Tell us the level of work to automate MTTD operations to enforce road traffic laws. To also quote Abraham Lincoln “you can fool all the people some of the time and some of the people all the time, but you cannot fool all the people all the time.” And therefore, the Akufo Addo Government must strive to eschew the penchant for lip service, deception and blatant lies. It is priceless to operate with candour and honesty. Unfortunately, it is what the Akufo Addo government lacked. Deputy Information Minister, Pius Hadzide who has now become ‘Ananias’ was at it lying on Peace FM on Monday morning without batting an eye, that the Ken Ofori Attah’s “Kenkey party” was a Finance Ministry staff durbar program when he knew it isn’t. Same Ananias Hadzide, was the one who told us the Castle militia group were prayer warriors. He was also embroiled in the Australian Visa scandal, a report the President is unprepared to make public. Joy FM's “Fact Check” program had twice caught ‘Ananias,’ our mouthpiece for lying to the public. But remember ‘Ananias’ and his boss, Kojo Oppong Nkrumah whom TEWU executives described as a liar are just servants in a con man's government. This author has authored 28 publications on Modern Ghana. Superintendent Kwesi Fori: The Party Police Of Our Time? Deliberate Neglect And Non-Creativity Affecting Aayalolo? akufo Addo’s Government To Scrap Trainee Allowance? A List Of 20 Corruption Cases Suffocating The “dog’’!! A Promised Cathedral; A Misled Dog! A Misled Country!!! !